PoE-through technology to serial connect and power of IP cameras. 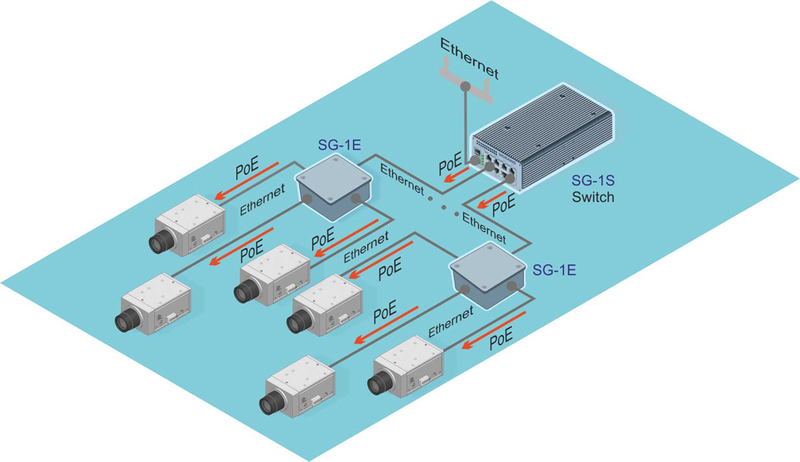 Sigrand SG-1C-111 and SG-1C-121 cameras have built-in 3-port switch that allow to connect to the network up to three devices. The camera MII interface connect to one port of this switch and two remaining ports go to external connectors. If one of the external interface is connected to a switch, the second is free and it is possible to connect other device. This allows to connect cameras to one another, to one port of the switch connect chain of cameras. 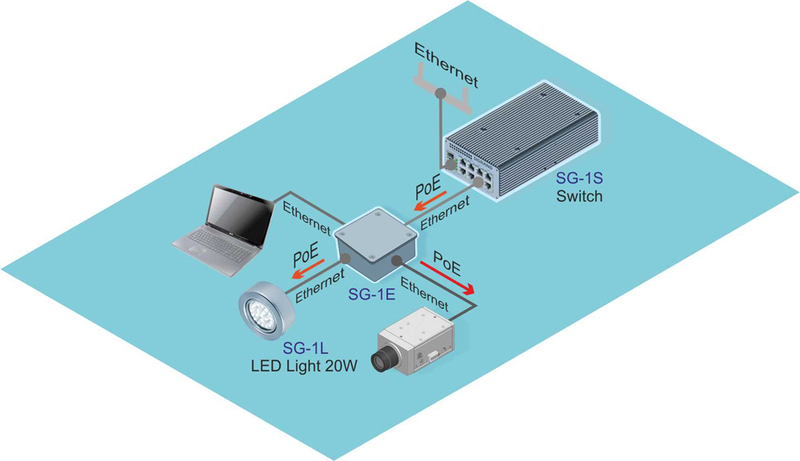 To power the chain of cameras used Passive PoE technology, power is supplied by two unused pairs of Ethernet interface and goes on through two external camera port. The maximum possible number of cameras in the chain depend on three parameters: the power of PoE injector , cameras energy consumption and the distance between them in the chain. If using the MS-17E8PP modules with 60W power injector , can be connected in chain up to 12 cameras at no great distance between them. If the distance between the cameras is the maximum for Ethernet 100 meters, a number of the cameras in a chain is limited 5-pieces. The length of the chain, from the switch to the last camera is 500 meters. This is possible because cameras can work on 30V low PoE voltage. At the moment this is the cheapest way to increase the distance from the switch to a camera, using of the same PoE technology.